This interesting and unusual surname is of Anglo-Saxon origin, and is a locational name from some minor, unrecorded, or now "lost" place, believed to have been situated in Lancashire, because of the large number of early recordings in that region. An estimated seven to ten thousand villages and hamlets are known to have disappeared since the 12th Century, due to such natural causes as the Black Death of 1348, in which an eighth of he population perished, and to the widespread practice of enforced "clearing" and enclosure of rural lands for sheep pastures from the 15th Century onwards. The component elements of the placename are believed to be the Olde English pre 7th Century "har", a boundary mark, with "snape", a pasture. 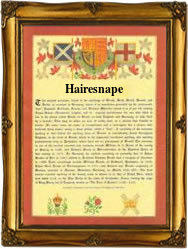 The surname has many variant spellings ranging from Haresnape, Harsnep and Harsnipe, to Hairesnape and Haresnaip. Recordings of the surname from English Church Registers include: the marriage of Robert Harsnep and Margaret Tarlton on August 26th 1542, at Goston, Lancashire; the marriage of John Hairsnape and Ellenor Ion on June 11th 1717, at St. Stephen's, London; and the christening of Francis, son of Robert Hairsnape, on February 1st 1747, at Cockerham, Lancashire. The first recorded spelling of the family name is shown to be that of Ellen Haresnape, which was dated January 14th 1548, marriage to Henry Heskin, at Croston, Lancashire, during the reign of King Edward V1, known as "The Boy King", 1547 - 1553. Surnames became necessary when governments introduced personal taxation. In England this was known as Poll Tax. Throughout the centuries, surnames in every country have continued to "develop" often leading to astonishing variants of the original spelling.